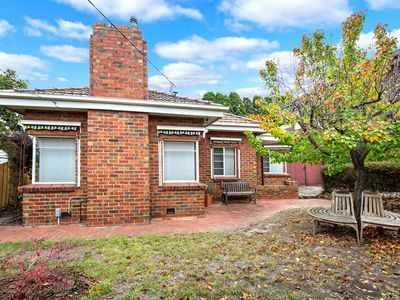 Positioned to perfection in one of Strathmore's favourite streets, this distinctive brick family home now offers a wonderfully rare and exciting opportunity to enhance and expand or start anew (STCA). Retaining its original elegance, the home's current floorplan comprises 4 bedrooms and 2 bathrooms, formal lounge and dining, additional spacious living, kitchen meals area and central updated kitchen, large seperate laundry. Heating & air conditioning, plus a substantial backyard with versatile studio/workshop, as well as additional off-street parking spaces. Walking distance to Woodlands Park and Napier Park, it's also close to public transport options, local cafes and shopping precincts, Strathmore Primary School, St Vincent's Primary and Strathmore Secondary College.